Well known to legions of film fans as the Secret Cinema setting for Star Wars and 28 Days Later, the breath-taking scale and versatility of the Printworks makes for a stunning backdrop. Formerly a print factory for the Evening Standard, Printworks has been transformed into an exciting new event space, spread over multiple rooms and levels. 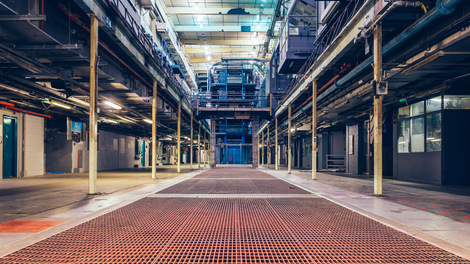 Six vast spaces, covering almost 120,000 sq ft, include blank canvas build spaces with vehicle access and the fully soundproofed Press Halls that still houses their original machinery. There is a maze of atmospheric corridors and small rooms, a modern reception area and a flat roof with views across London. Set on a secure, gated, 15-acre site, Printworks offers plenty of parking and easy accessibility to central London, being just a few minutes’ walk from Surrey Quays tube station. Having previously featured in a Bond film and the recent Criminal, staring Kevin Costner the site was probably used to most spectacular effect in Avengers: Age of Ultron, when it was transformed into a ship for a key fight scene.